Buford Betty: One month, already?! It's true... today Sam is ONE whole month old! We of course had to come up with some creative ways to document his monthly growth. My SIL sent us a fun idea she found on Pinterest where you put baby in an outfit that's entirely too big for him at first, and photograph him in the same one every month to see how he grows into it. So we did that with a size 12mo sleeper - which totally swallows him right now! And the "main" pic is this one - just a simple overhead view of him on a blanket with one of MY old toys - a crocheted Cookie Monster doll. Love it! 1. You will need a plain onesie or tee for each month. I just went with plain white onesies by Carters. (Or sorry, "bodysuits" since Gerber officially coined the term "onesie" - whatev.) And I'm doing these month-by-month because who knows what size Sam will need as he grows! 2. Assuming you've got an iron and a printer at home, the only other thing you need is iron-on printer paper. I have found this at the grocery store, but Walmart usually has it and certainly any office supply store would. It comes in the same packaging as labels - so look for those. I used Avery brand and it comes in two varieties - one for light fabrics and one for darker fabrics. 3. I designed my own image just using Microsoft Word - I went really simple. But you can get as fancy pants as you want. Design your own decal, or find some clip art or other pictures to use. The big thing to remember here, once you're ready to print, is you'll need to print a mirror image of the decal. Some programs have you do this through the print menu, or you may be able to flip the image itself before printing. I created my image in Word and then copied it into Paint (yeah, that free program under your Accessories - love it) and printed from there. So I just flipped the image itself before printing. 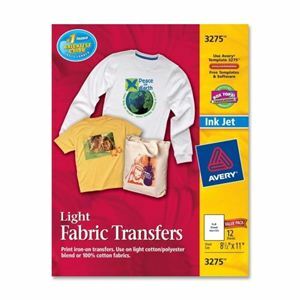 One other thing to note - this iron-on paper is designed for inkjet printers. I broke the rules and used a laser printer though. It worked fine for these small and simple images, but really an inkjet printer will do best. The heat from a laser printer screws up the iron-on material some and may affect your decal. But the image itself transfers fine if the paper around your decal survives the printing (which mine did). So there you go. We are obviously having a complete BALL with Sam. Love him to pieces. He is ridiculously cute. He's a good sleeper too. The nights are hard... we've had to grow accustom to "naps" rather than getting a full night's sleep, but we're coping well. He's a fabulous eater and pooper too. The plumbing is definitely working. His projectile pee and poo range is quite impressive. I just recently had to start a clothes bin for items he's already outgrown! I mean, really! He's out of most of his NB items and is in 0-3mo or 3mo sizes now. He's growing like a weed, that's for sure. I've got lots of great post ideas swimming in my foggy head right now... it's just a matter of finding the time and opportunity to sit down at the 'puter and get them posted. I definitely want to share my favorite maternity items and baby items so far, among other things. You know I love dishing on fun clothes and products! And as I mentioned, I need to get our nursery pics up! My Dad took a bunch of great ones after we got everything finished, so I'll have to get those on here shortly. Also... any fun Valentine's Day plans, y'all? We typically stay in and do fondue for V-Day, but seeing as we stay in like ALL the time lately, that's not quite as appealing this year! So we are having our first official date night on Tuesday! Well, date afternoon really. My parents are going to watch the little man at our house while the hub and I go to see "The Vow" and then have an early dinner at a local Italian restaurant. We have 5pm reservations - which officially makes us old farts. Seriously, who eats at 5pm? People with one-month-old's at home with grandparents waiting to have their own Valentine's dinner out. Yep, Nana and Grandpa have 7:30pm reservations, so we'll be home in time to relieve them. And we thought caring for the dogs was hard enough to coordinate! Ha! Looking forward to it... you know I love Valentine's! Any reason to celebrate is... well... a reason to celebrate! Hope you all have a great one filled with lots of love! He's darling!!!! Congratulations. Time flies, doesn't it? He's so cute! I can't believe it's been a month already! Time flies! What a cutie! We're six days away from one month and I can't believe it! Time flies! Enjoy it! OMG.....the picture of him in the PB basket is ADORABLE !! I could just eat him!! What a cutie! Love the onesie - I'm so impressed! He's SOOOO cute!!!!! LOVE the pics!!! Thanks for the iron-on idea too! I'm seeing lots of potential uses for that!! What a precious babe! Seeing his sweet little face just makes me swell with happiness for you! What a loved little boy!